Simple fish shacks — food for coastal families, cooked and caught by coastal families — are disappearing throughout the South. Desposito’s may be soon to follow. 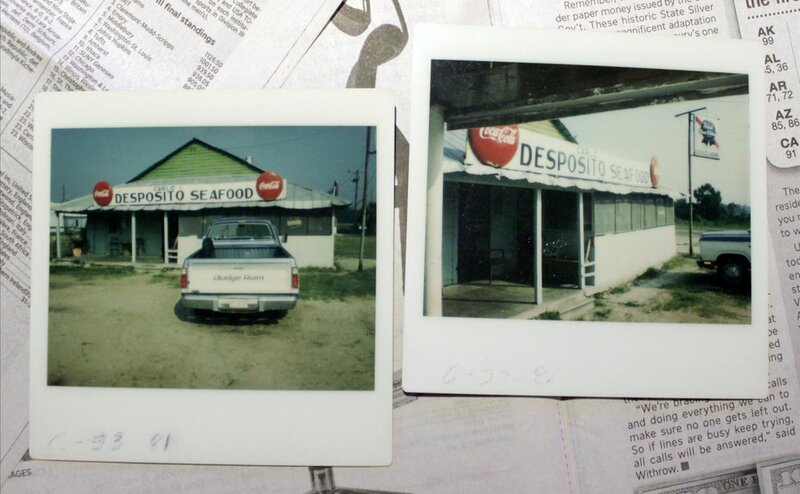 For more than a half-century, Desposito’s Seafood Restaurant has served the best boiled shrimp on the Wilmington River. For decades, it competed with a host of other family-run businesses, but all of them have folded. Simple Southern fish shacks — food for coastal families, cooked and caught by coastal families — are disappearing throughout the region. And Desposito’s may be soon to follow. Thunderbolt, Georgia was, through most of the 20th century, a seafood empire. A square mile and a half of village strewn along either side of the banks of Chatham County’s Wilmington River, the economy thrived with canneries, frozen-food purveyors, and hundreds of shrimp boats, “docked four deep on each side,” I’ve been told. 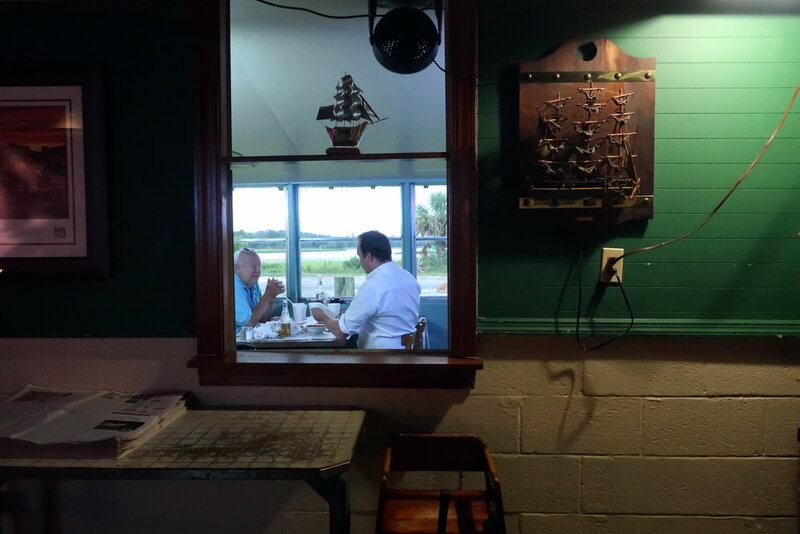 Today, a spin through town reveals some tucked-away houses, and on the main stretch, a tattoo parlor, a lawyer’s office, Tortuga’s (with brunch), Tubby’s (with beer), a marina, a lone shrimp dock, beat up by a recent hurricane. Where there used to be other docks and marinas, a fortress wall of condominiums usurps the view of the water. On the east side of the river, across from Thunderbolt village, is the Isle of Armstrong — a more secluded patch of Thunderbolt with a few houses, a few boat-related businesses, another shrimp dock, and a seafood restaurant with glowing beer signs in the windows. 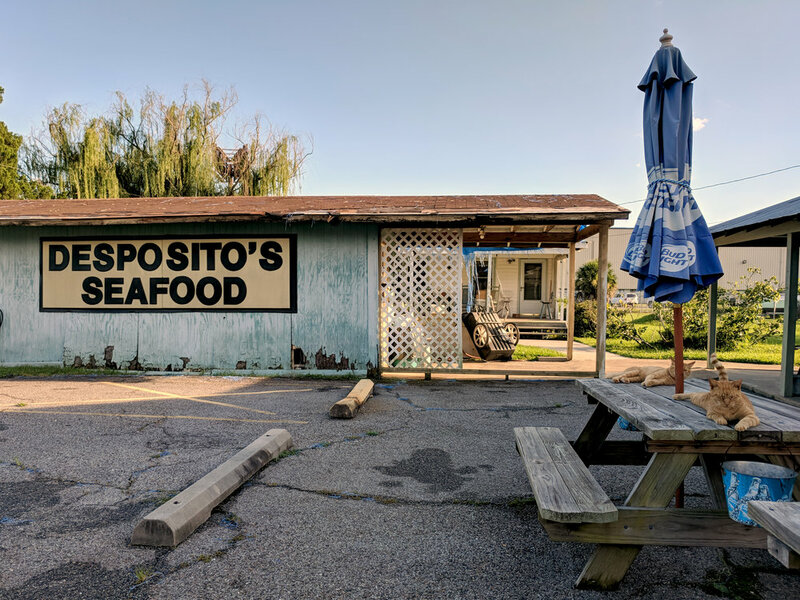 The restaurant has been there, more or less unchanged, since the early 1960s, when an Italian dock worker bought it from the previous owners, and renamed it Desposito’s. His family has run it ever since. Desposito's on the Isle of Armstrong in 1981. Now, it’s a steamy afternoon in late July and I’m driving east on 80, across the family of islands between the Wilmington River and the sea, looking for any trace of the way things were when this was a bustling port, and Carlo Desposito first opened up shop. Crossing Turner Creek from Whitemarsh to Talahi Island, skinny wooden docks protrude from new-construction homes like tentacles over the marsh grass. On the right is Paula Deen’s Creek House, a sprawling complex that opened in 2017. It resembles an outlet mall and seats 320. Across the Wilmington River from the Isle of Armstrong in Thunderbolt, shrimp dock Thunderbolt Fisherman's Seafood has been around since before World War II. In mid-summer 2018, few boats came in, and business was slow. I get to the mouth of Tybee Island where Patrick Matthews owns a stretch of waterfront on the Lazaretto Creek. We stand on the dock his grandfather built in 1947. “What did this look like when you were a kid?” I ask. Captain Stevie Morrison’s sole crew Nick Scott, with girlfriend LaToya, aboard the only shrimp boat to came into Thunderbolt Fisherman’s Seafood during a week in mid July 2018. In past seasons, several boats a week or more would bring in catch. David Boone is leaning on the bar with a dish towel in his hand and a green bandana on his head. No doubt in his mind about this. The Williams Seafood sign still stands at the entrance to a condominium development on Bull River, amidst signs for casino cruises and dolphin tours. Where the restaurant once stood is an empty lot for sale. 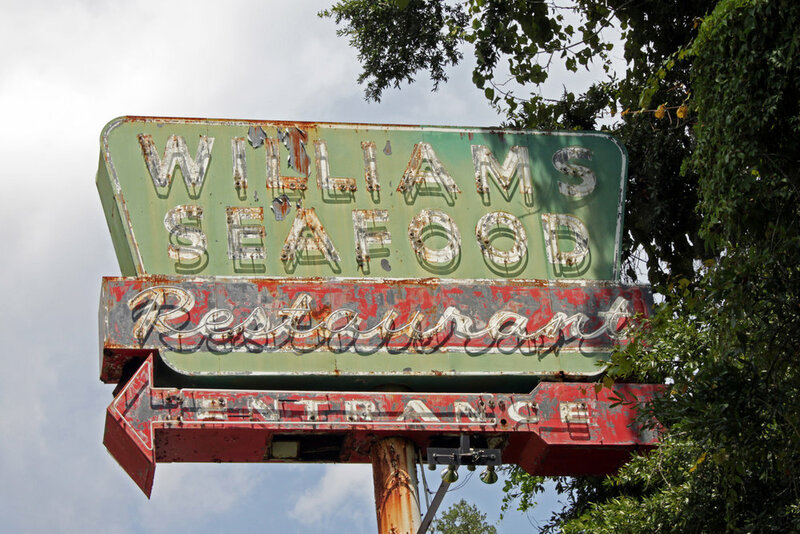 In 1936, Williams Seafood opened first as a roadside stand. Three generations of Williamses ran the place, “a fixture in this community,”people say, until its demise by arson, also in 2004. Its mid-century competitors, like Frank Paris, Allie’s Wharf (with a sign that read "Where the elite eat in their bare feet"), and Tassie’s Pier, were all long closed by the time Teeple’s was shuttered and Williams burned. David Boone owns an old mom-and-pop restaurant, too — that gritty seafood shack on the outskirts of Thunderbolt. His mother, Walton Boone, ran it before him, and her late husband Carlo Desposito before her. Now, Boone runs Desposito’s alone. David Boone catches up on paperwork at the bar in off hours. “You want me to tell you what it’s like? Man. It’s open and cozy and full of electric beer signs. Great ones. Works of art, I always thought,” says Bobby Zarem, the famed New York and Hollywood publicist, native Savannahian, and Desposito’s patron forever. Zarem is 82 now. The truth of the menu is that Boone has made small changes since he took over day-to-day operations from his mother — the addition of coleslaw, shrimp salad, a Lowcountry boil; you can get beer in a bottle now, no longer just a can. But the updates are negligible. Despite changing popular tastes, unlike Williams, he never took to frying his shrimp, for example. Another longtime Desposito’s fan, Frank Hill, is about Zarem’s age — a year younger. His late wife, Mildred Teeple Hill, was Charlie Teeple’s sister, and ran Teeple’s restaurant until it closed. Hill remembers the secluded spot — tucked away by itself next to a boat put-in on the tiny Isle of Armstrong — as a place where the “upright and uptight” could “come let their hair down.” His favorite thing about both places: There is seafood, and if you don’t like seafood, you can go somewhere else. Tablecloths at Desposito’s are back issues of the Savannah Morning News. “It’s not for everybody,” I say. Zarem thinks he’s been going to Desposito's since he was about 12 years old. Maybe longer. That would put him in an old wooden chair at a newspaper-covered table room in the late 1940s, picking apart a basket of boiled shrimp, even before Carlo Desposito took it over. Boone tells me that from the 1930s onward, Desposito’s was still the Walton family’s seafood market, which Carlo would later purchase and continue to run pretty much exactly as it was: simple dishes, a hanging scale over the display case counter, the building sinking into the marsh. Carlo Desposito was the son of a Georgia native, Annie, and an Italian immigrant dock worker, Ralph. He was 40 when he retired from his own job at the docks and began working at George and Edna Walton’s mom-and-pop market in 1965. Three years later, in ‘68, he bought the place from them and put his name on it. This was also the year he met Walton Boone, mother of five, including 10-year-old David. “When Carlo took this place over, he ran it more like a social club than a restaurant,” Boone says. “They had a pretty good little hideout back here.” He wasn’t much for children getting underfoot, but he welcomed his friends — veterans, fishers, locals — and they would eat whatever he cooked that night. He passed away a young man of 57 in 1982, leaving Desposito’s in Walton’s care. David Boone rights himself slowly from a crouch. He was kneeling on the poured concrete floor of Desposito’s front porch, pointing out the place where someone had carved the name CARLO, and smaller underneath it, WALTON. “When I redid the kitchen floor, we buried a time capsule.” That was 10 years ago when Boone still had kitchen staff working under him. In 54 years of operation, Desposito’s has seen tides ebb and flow. Back in 2008, along with the kitchen renovation, Boone replaced the roof and made other improvements. Just months later, the economy came crashing down. We head through the dining room, back to the long bar bedecked with beer-brand ephemera. Through the window, you can see the house, just a matter of feet behind the restaurant where Boone’s mother Walton lived until October, around the time Hurricane Matthew put the Isle of Armstrong under a few feet of water. Now, she lives with Boone. We step out the back door. Boone lights a Winston he’s been holding for a minute and leans against the porch rafter. Walton Boone is 84 years old. “I ran this place for a long time,” she says. Walton nestles under a nubby throw blanket in a big recliner pulled up to a two-top in the barroom corner near the front door. “Then, I guess I just got old. Didn’t mean to,” she tells me, “but I did.” She doesn’t remember how she first met Carlo. “That was so long ago,” she says. I believe her. Every night the patrons, on their arrival or exit, veer to Walton’s table. Walton Boone and her son David Boone standing outside Desposito’s. Boone tells me about how his mother grew up in the middle of nowhere, between Millen and Sardis, Georgia. Her parents raised her on a farm during the Great Depression, and work is what she knows. Walton picked cotton, milked cows, raised chickens. ”What do you remember about working here?” I ask her. “Did you ever get to come here and just relax? Have a drink?” I ask. When Walton took the reins at Desposito’s, good help was nil. “At one point, I almost got away, too,” Boone says. Walton’s four other children made other plans. But Boone was in his early 20s, cycling through odd jobs: He buried phone cables, restored furniture, joined the National Guard. He points to a photo on the wall in the dining room. He swivels his big green vinyl barstool toward Walton. “He's good at everything he does,” Walton says. Stephen Criswell, a folklorist at the University of South Carolina Lancaster, has a particular interest in the disappearance of North Carolina fish camps — distinct, family restaurants (food for families cooked by families) that cater to a blue-collar clientele. If there are no workers there to spend money, Criswell’s work observes, the restaurants lose business and ultimately fail. There were “fish camps” on Savannah’s islands even before refrigeration. In the Georgia heat, fishermen needed a place to cook and eat what they caught not long after they caught it. Fish camps were ready to clean, prepare, and serve you what you brought in for not much money. If you’d caught enough, they could serve others. Frank Hill is the one who first tells me about Green’s Fish Camp on Wilmington Island. He recalls the waning months of World War II when his family would fish to supplement their food rations and cook their catch at camps like Green’s. 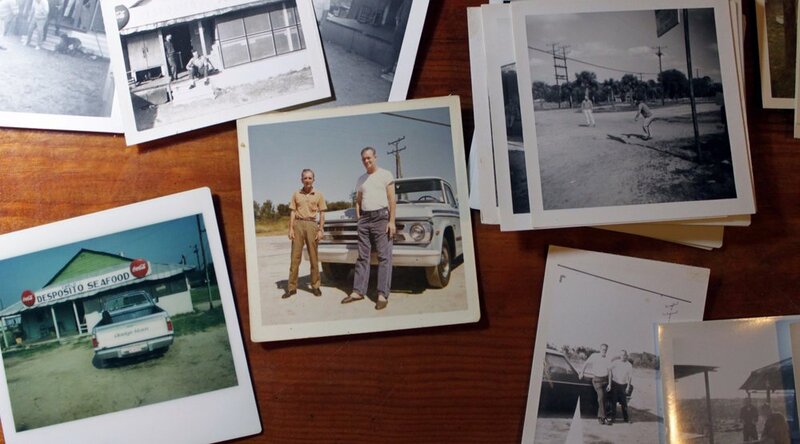 There was no single employer in Thunderbolt, per se, but seafood was the line of work most everyone shared. And as the ability of small, family businesses to profit from the industry has waned, the closings Criswell has seen among the adjacent family restaurants in the Carolinas has happened here, too. Hill remembers how hard it was for Mildred and Charlie to run Teeple’s. “Do you think your children had any interest in running Teeple’s? Or did they have other interests?,” I ask Hill. Charlie Teeple’s restaurant, on River Street in Thunderbolt, has been razed, but this building, his seafood market, still stands behind the Thunderbolt Museum on East Victory Drive (Route 80). We’re sitting on the smoking porch again — one of the rare chances, on a slow night between orders, when Boone can clear a few minutes to talk about his place. He’s never had time to put a little of the place's history on the back of the printed menus, but he’s always wanted to. “It’s a part of our history, that — unless something changes — it’s gonna be wiped clean.” He turns an unlit Winston over and over in his fingers. “You don't carry that respect for history when you're younger. I didn’t. But as you get older, you come to realize these things are important: to understand your past, and where you're going in life, or where you came from. Now, it’s a Saturday night in early August — Desposito’s biggest night of the week, when families stream in. I’m heading out of town for a few weeks, and I want to have dinner at the bar again before I go. I want to watch diners’ silhouettes animate the long, front-porch windows, to see the green walls glow in the neon blue beer lights. I drive over the Wilmington River bridge shortly after the opening hour. When I take the hairpin turn at the foot of the bridge onto the Isle of Armstrong, and pull up the gravel easement road toward the restaurant, another car is turning around, trying to get back out to Route 80. I see their sad faces through windshields and realize they’re pulling out of Desposito’s empty lot. Garfield and Willy, the orange tabby — strays Boone and Walton felt they had to adopt — are brawling between the picnic tables and the smoking porch. Walton’s pots of Christmas Cactus are hanging over a cluster of empty cat food bowls. I peer through the windows. Inside, the fans are on, but the lights are off. Papers lie stacked at the end of the bar, and all the chairs are up on the tables. As of January 2019, Desposito’s is “on the market,” and open Tuesday through Saturday.